The battle against cancer has been waged for several decades without resounding curative success from the use of chemotherapy or radiotherapy in most common solid tumors. Much of the present day research directed against active malignancy has shifted toward identification of strategies affecting the growth rate or apoptosis of such cells so that life with cancer can be greatly extended without the deleterious effects of the more aggressive therapies. The large majority of malignancies are attributable to dietary and lifestyle factors. In addition there are many environmental chemical factors suspected of playing a sizable role in the occurrence of malignancies. Given the poor success rate for treatment of most common tumors, it seems logical to focus attention on ways to prevent cancer occurrence. Data exist in the scientific literature showing reduction in the risk of tumor occurrence achieved by the use of nutritional and other natural materials. Use of these materials along with attention to the dietary and lifestyle factors comprise for the average person perhaps the best presently available strategy for prevention of malignancy. It is now possible to perform genetic testing which can predict the likelihood of certain types of malignancies in an individual from a family appearing to have a predisposition toward a particular type of cancer. These individuals appear to be born with one mutated gene of the multiple significant mutations necessary to trigger most malignancies. Being one step closer to developing a malignancy than the rest of the population does not predestine the person to the malignancy, but it does suggest that whatever means are available to retard subsequent gene mutations should be employed. Whether or not such a predisposed person is willing or able to obtain genetic testing, it is the recommendation of the authors that such person receive counseling as to preventive strategies to counteract their suspected predisposition. The subject of cancer recurrence is more complex. Conventional oncology protocols call for use of procedures that are best indicated in a given situation (surgery, chemotherapy, radiotherapy, etc., or a combination), and if remission is achieved, treatment is followed by a period of sustained observation. Even during the period of remission, the presence of latent malignancy is considered possible. In addition to the possibility of latent malignancy, a person who has undergone cancer treatment is at increased risk of developing a second primary malignancy. These possibilities make long-term adjunctive therapy with natural supplements and dietary and lifestyle modifications after standard oncology therapies attractive and logical. The occurrence of a malignant cell line suggests the presence of other cells ­ with significant mutations but short of outright malignancy ­ surrounding the tumor. Continuation of the same exogenous influences that created the first malignant cell could lead to additional significant mutations, such that these surrounding cells also progress to malignancy. The results from a number of studies concerning the limited cytotoxic effect of nutrients on malignant cells  argue against the possibility that supplementation with these four nutrients caused the regression of remaining malignant cells. The authors believe it is more likely the nutrients slowed additional mutation of non-malignant cells in the bladder that already had significant mutations. The remainder of this article provides a summary of the human chemoprevention trials using natural agents. The second paper in this series will survey the animal and in vitro literature regarding the use of natural agents in chemoprevention. The concluding article will also contain nutritional recommendations for the primary and secondary prevention of colon, breast, and prostate cancers. Several possible conclusions can be drawn based on these data. The first is that supplementation with all-trans beta-carotene, at least in smokers, may be unsafe. It is presently unclear why this would be true, but the answer might be either the existence of a pro-oxidative effect  or a competitive inhibition of other carotenoids by such high doses of beta-carotene. The cis-isomers of beta-carotene may be this nutrient's most active isomers. [15,16] An additional conclusion is that even small doses of vitamin E (50 mg of dl-alpha-tocopherol being equal to 55 IU) offer significant protection against prostate cancer. (Issues regarding beta-carotene isomers are very complex and the subject is reviewed in "Beta Carotene: The Controversy Continues," by Lyn Patrick, ND, published in Alternative Medicine Review, vol. 5(6)). In the Beta-Carotene and Retinol Efficacy Trial (CARET), 18,000 smokers, former smokers, and workers who had been exposed to asbestos were recruited for a double-blind, placebo-controlled trial of the preventive efficacy of a combination of all-trans beta-carotene (30 mg per day) and retinyl palmitate (25,000 IU per day). After an average of four years of supplementation, significant increases were seen in total mortality (RR = 1.17; 95% CI: 1.03-1.33), lung cancer incidence (RR = 1.28; 95% CI: 1.04-1.57), and lung cancer mortality (RR = 1.46; 95% CI: 1.07-2.00) in the active treatment group compared to those taking placebo. No effect of active treatment on incidence of other cancers or survival after diagnosis of cancer was found. The excess risk of lung cancer appeared to be confined to current smokers and asbestos workers, and not in former smokers. The trial was halted early due to excess mortality associated with active treatment. These data confirm the findings of the ATBC Trial that supplementation of smokers (and apparently asbestos workers as well) with all-trans beta-carotene is associated with a greater risk of lung cancer incidence and mortality. Since this trial did not use a 2 x 2 design, the comparative effect of beta-carotene and vitamin A could not be ascertained. The results of this trial, together with CARET and ATBC, suggest the excess risk of supplementation with beta-carotene is confined to those at high risk of lung disease (e.g., smokers, asbestos workers) for reasons not yet clear. What is more puzzling, however, is why no excess lung cancer risk appeared in this study in current smokers. While the number of smokers in this trial was an order of magnitude lower than the other two, a trend toward increased lung cancer risk would still have been predicted. In fact, the opposite was true: there were 10-percent fewer lung cancers in smokers taking beta-carotene supplements. Until this issue is resolved, these last data should be considered an anomaly, and all-trans beta-carotene should not be offered to smokers. In the second Linxian trial,  29,000 healthy, randomized individuals received daily supplementation with one of four nutrient combinations: (1) 5000 IU retinyl palmitate + 22.5 mg zinc (zinc oxide); (2) 3.2 mg riboflavin + 40 mg niacin; (3) 120 mg ascorbic acid + 30 mcg molybdenum (as a yeast complex); or (4) 15 mg beta-carotene (source not provided) + 50 mcg selenium (from yeast) + 30 mg alpha-tocopherol (source not provided). After 63 months of supplementation, lower total mortality (RR = 0.91; 95% CI = 0.84-0.99), total cancer incidence (RR = 0.87; 95% CI = 0.75-1.00), and stomach cancer incidence (RR = 0.79; 95% CI = 0.64-0.99) was observed in subjects taking beta-carotene, selenium, and vitamin E. No significant effects were exhibited in the other three treatment groups. These studies appear to demonstrate that supplementation with certain nutrients at levels that replace dietary deficiencies may be useful in preventing cancer. It is not clear whether these results apply to a population in less danger of gross nutritional deficiency. A double-blind, placebo-controlled trial using a combination of vitamins and minerals was employed to determine if the recurrence of superficial bladder cancer could be prevented post-resection.7 After tumor resection 65 patients were randomized to receive either a multi-vitamin/zinc supplement with RDA concentrations of all components, or the RDA multi-vitamin/zinc supplement plus 40,000 IU vitamin A acetate, 100 mg vitamin B6, 2,000 mg vitamin C, 400 IU vitamin E, and 90 mg zinc per day. Patients were also randomized to receive intravesicular administration of BCG with or without percutaneous BCG administration (BCG is an immune-stimulating bacillus). During five years of supplementation, tumor recurrence was seen in 80 percent of the RDA vitamin-supplemented group, but in only 40 percent of those receiving the mega-dose vitamin therapy (p = 0.0011). Although the patient survival rate was nearly identical between treatment groups, the interval-to-death in the RDA group patients was 18.6 months but 33 months in the mega-dose vitamin group (p = NS). Addition of percutaneous BCG to the therapeutic regimen did not affect the results. Several important conclusions can be drawn from these data. One is that the paradigm of supplementation of antioxidants and other nutrients as a group is an effective means of preventing bladder cancer recurrence. The lack of reduction in mortality may reflect an inability to help those patients who had the most genetic damage (and thus the most aggressive tumors) at the outset of the study. Instead, what this treatment was likely doing was protecting against further genetic mutations of the tissue around the resections. Beginning in 1983, 1,312 patients with a history of two or more skin cancers (basal or squamous cell carcinomas) and no other malignancy in the previous five years were randomized in double-blind fashion to receive either 200 mcg selenium (from yeast) or placebo. The selenium in yeast is largely (85%) in the form of selenomethionine. The trial patients were chosen from areas of low soil levels of selenium. Selenium treatment lasted an average of 4.5 years. Subjects in the selenium group did not have a significant reduction in the risk of skin cancer recurrence compared to those taking placebo. They did, however, have a 63-percent reduction in prostate cancer risk (p = 0.002), a 58-percent reduction in colon cancer risk (p = 0.03), a 46-percent reduction in lung cancer risk (p = 0.04), a 50-percent reduction in total cancer mortality (p = 0.002), and a 37-percent reduction in total cancers (p = 0.001) ­ findings all significant compared to placebo. That breast cancer rates were not reduced in the supplementation group compared to placebo may have been due to the low percentage of women in the trial (25%). Since this trial was in an area with a low soil selenium level, whether selenium would have a similar effect in the population at large remains an open question. However, since produce is increasingly being transported long distances to market, local soil selenium levels may not have the importance they once did. Further trials are necessary to elucidate this point. Regardless, the reduction in cancer risk observed in this trial was clearly significant ­ clinically, as well as statistically. The study's authors made several points about their findings. A possible explanation for the difference between the response in pre- versus postmenopausal women is the finding that fenretinide reduced serum levels of insulin-like growth factor-I levels in the premenopausal women, but not postmenopausal. They also hypothesized a possible effect of circulating estrogens on the gene control exerted by the retinoid. The fact there was an effect both on ipsilateral and contralateral recurrence risk may reflect an activity in the initiation and promotional stages of carcinogenesis. The lack of effect seen on distant metastasis, however, suggests the effect of fenretinide is lacking on more malignant phenotypes. The applicability of these data to the question of whether vitamin A itself could prevent breast cancer is not clear. In the European Study on Chemoprevention with Vitamin A and N-Acetylcysteine (EUROSCAN), 2,592 patients with a history of non-small cell lung, oral, or laryngeal tumors (all tumors graded T1-3, N0-1) were randomized to receive treatment with one of four protocols: (1) retinyl palmitate, 300,000 IU per day for one year followed by 150,000 IU per day for a second year; (2) N-acetylcysteine, 600 mg per day for two years; (3) both compounds; or (4) no intervention. Previous therapies in treated subjects included surgery (57%), radiotherapy (29%), chemotherapy (3%), or both surgery and radiation (14%). Of these patients, 93 percent had smoked at some time previously, and 25 percent continued to smoke after diagnosis. All patients were considered to have a complete response to the initial treatment of resection, chemotherapy, and/or radiation. No significant change in the risk of tumor recurrence, second primary tumors, or survival was noted in any of the treatment groups compared to no treatment. Earlier preliminary trials had reported either an increased  or decreased  risk of tumor recurrence in patients supplemented with vitamin A. Both trials were only of one year duration, and neither reported a statistically significant treatment effect. An editorial accompanying the EUROSCAN results underlined the apparent difficulty seen in the chemoprevention of lung cancer compared with other common tumor types. These results should make it abundantly clear that single antioxidant agents alone are not likely to prevent lung tumor recurrence. It should be noted these data do not answer the question of whether either agent could be useful for primary prevention, although the results of the CARET suggest vitamin A may not be effective either in preventing initial tumor occurrence. This trial did not demonstrate increased cancer recurrence risk in current smokers supplemented with either vitamin A or NAC. This suggests that not all antioxidants are contraindicated in smokers, and that the deleterious effect seen in the ATBC trial and CARET is likely limited to use of beta-carotene, and possibly specifically all-trans beta carotene. Squamous metaplasia is a precancerous condition of the bronchial tissue often associated with heavy smoking. A group of patients with histologically proven squamous metaplasia (n=38) were randomized to receive either oral treatment with 10-20 mg per day folate and 750 mcg vitamin B12 (methylcobalamin) or no treatment for one year. In 31 metaplastic lesions in the treatment group (in 21 subjects), improvement was noted in 90 percent, and complete resolution was seen in 71 percent (p < 0.01). No significant change was seen in the control group. It is too early to conclude that folate and vitamin B12 supplementation reduce the risk of lung cancer in smokers. This study was much smaller than other lung cancer trials reported here. Also, this study looked at an outcome that was a precancerous condition, rather than a true malignancy. Regardless, this presents a new paradigm for lung cancer prevention. The other lung cancer prevention trials used antioxidant nutrients and have been mostly unsuccessful. In a double-blind, placebo-controlled trial, 30 women with biopsy-proven cervical intraepithelial neoplasia (CIN; grade II or III) were randomized to receive treatment with indole-3-carbinol (I-3-C) at a dose of 200 mg/day, 400 mg/day, or placebo for 12 weeks. 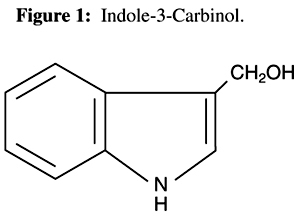 I-3-C, a compound found in cruciferous vegetables (Figure 1), modulates cytochrome p450 function in such a way as to increase the 2-hydroxy/16-hydroxyestrone ratio. Four of eight women taking 200 mg I-3-C per day and four of nine women taking 400 mg per day experienced lesion regression (p < 0.05). No regressions were noted in the placebo group. These data should be interpreted with caution; the sample size was small and spontaneous CIN remission is common. Regardless, these results are significant over a short treatment period, and should be followed up with larger trials. The estrogen-modulating effect of I-3-C makes it a compound of interest for breast cancer prevention, and it will be discussed further in the second part of this paper. Two trials looked at the ability of supplemental high-dose folic acid to cause regression of cervical lesions. In the first trial, 47 women with mild to moderate CIN were supplemented with 10 mg folic acid or 10 mg ascorbic acid (placebo) for three months. Each woman in the trial had used oral contraceptives the preceding six months. Women supplemented with folic acid had a significantly better average post-trial cytology score (p < 0.05) and a significantly better improvement from baseline (p < 0.05) than subjects taking placebo. Five women taking folic acid had a normal follow-up cytology score, compared to one taking placebo. In the second double-blind trial, 331 women with atypia or mild to moderate CIN were randomized to receive treatment with 5 mg folic acid or placebo for six months. Half of the women in the trial were current users of oral contraceptives and 90+ percent had used them in their lifetime. No significant difference in the number of spontaneous regressions was noted between treatment groups. It is unclear whether the difference in the results in the two studies was due to folic acid dose, initial severity of lesions, or chance. Colorectal adenomas are a common experimental model for chemoprevention of colon cancer because they can be easily observed by colonoscopy. They also have a high rate of recurrence and malignant transformation. Several clinical trials have examined the ability of nutrient interventions to prevent recurrent adenoma formation. Low-fat, High-fiber Diet: After resection of colon polyps, 201 subjects were randomized to receive either dietary counseling on a low-fat (<50 grams per day or <20% of calories), high-fiber (50 grams per day) diet or no dietary intervention. No overall effect of the dietary counseling on polyp recurrence risk was noted. When the data were analyzed by gender, however, women appeared to reduce recurrence risk by 50 percent with dietary counseling, while men appeared to double their risk by changing diet. Compliance in the study was disappointing, with neither the low-fat nor high-fiber goals being met in either gender. Post-resection of colonic adenoma, 1,905 subjects were randomized to receive either dietary counseling to establish a low-fat (<20% of calories from fat), high-fiber (18 grams per 1,000 kcal) diet or no dietary recommendations at all. Subjects given dietary recommendations did not have any reduction in the risk of adenoma recurrence compared to the control group over the three-year median follow-up period. Although the dietary goals of the counseling were not met in this study, significant dietary changes did occur in the counseled subjects. Supplemental Fiber: Subjects who had undergone resection of a colonic adenoma in the preceding three months (n = 1429) were randomized to be supplemented with a cereal or snack bar containing either 13.5 grams or 2 grams of wheat bran fiber for three years. No significant reduction in the risk of colonic adenoma recurrence was noted in the subjects taking the high-fiber supplement compared to those eating the low-fiber cereal or bar (OR = 0.88; 95% CI: 0.70-1.11, p = 0.28). Compliance was an issue, however, with only 69 percent of the participants eating three-quarters of their assigned high-fiber supplements in the final year. High-fiber, Low-fat, and Beta-carotene: In a randomized trial,  patients with a history of colonic adenoma (n = 390) were randomized to receive treatment with either (1) 20 mg per day all-trans beta-carotene; (2) 25 grams per day wheat bran; (3) a reduced fat diet (<25% total calories from fat); (4) combinations of the preceding treatments; or (5) no additional treatment for up to four years. There was no reduction in adenoma recurrence risk in any treatment group. A non-significant reduction in large adenoma formation (a risk for progression to malignancy) was observed in patients on the low-fat diet and those taking the wheat bran. Patients taking the wheat bran on the low-fat diet had a significantly lower occurrence of large adenomas (p = 0.03) than the other groups. The small number of subjects undergoing each of these interventions (seven treatment groups total) weakens the study's conclusions. Fiber and Antioxidants: In a double-blind, placebo-controlled trial,  58 patients with familial adenomatous polyposis were randomized to receive four years of daily treatment with either antioxidants (4 grams vitamin C and 400 IU alpha-tocopherol), antioxidants plus 22.5 grams of a bran fiber cereal, or placebo. No significant effect of antioxidant supplementation was noted, but there was a reduction in the risk of adenomas in subjects taking the high-fiber supplement. The effect of the fiber appeared to be greatest during the second and third years of the trial, and was statistically significant at some, but not all of the patient follow-up visits. Polyp area was not reported in this trial. Vitamin C: A double-blind trial looked at the effect of vitamin C on patients with familial polyposis. Subjects were supplemented with either 3 grams vitamin C per day (delayed-release capsules) or placebo for two years. A significant reduction in polyp area was noted in this trial (p < 0.03), as well as a trend toward reduction in polyp number during some periods of the study. This suggests vitamin C may have an effect on polyp promotion, as well as a slight effect on initiation. Antioxidants: In the Polyp Prevention Study,  864 patients with a history of colonic adenoma were randomized to receive one of four treatments: (1) beta-carotene, 25 mg per day; (2) vitamin C, 1 gram daily and vitamin E, 400 mg per day (d-alpha-tocopherol); (3) all three antioxidants; or (4) placebo. No reduction in the risk of polyp recurrence associated with any treatment was noted. Risk of the largest adenomas was similar among treatment groups as well. A double-blind trial studied the effect on adenoma recurrence of supplementation with 400 mg of vitamin C and 400 mg vitamin E (unspecified type) versus placebo for two years. Of the 137 subjects who completed the study, a non-significant, 9-percent reduction in polyp recurrence risk was noted in the treatment group. In the Colorectal Cancer Study at the University of Modena, 255 subjects with a history of colonic adenoma were randomized to receive treatment with either (1) vitamin A (axerophthol palmitate, 30,000 IU per day), vitamin C (1 gram per day), and vitamin E (d,l-alpha-tocopheryl acetate, 70 mg per day); (2) lactulose; or (3) placebo for an average of 18 months. At the end of the treatment period, adenoma recurrence had occurred in 5.7 percent of the antioxidant vitamin group compared to 35.9 percent of the placebo group (p < 0.001). Antioxidants and Minerals: In a double-blind trial, 116 patients with currently non-resected polyps were randomized to receive either placebo or a daily mixture of beta-carotene (15 mg), vitamin C (150 mg), vitamin E (75 mg), selenium (100 mcg), and calcium (1600 mg as calcium carbonate) for three years. No difference was noted in the rate of growth of existing adenomas between the two treatment groups. There were, however, significantly more subjects free of new adenomas in the active treatment group compared to placebo (p = 0.035). Calcium Carbonate: Supplementation with 1200 mg of calcium (as calcium carbonate) for four years was associated with a significant, 15-percent reduction in the risk of adenoma recurrence (p = 0.03). In this double-blind trial (n=832), the average number of adenomas seen in calcium-supplemented patients was 24-percent lower than in those taking placebo (p=0.02). Folic Acid: Sixty patients who had undergone recent resection of colonic adenomas were randomized to receive treatment with either 1 mg per day folate or placebo for two years. Adenoma recurrence was seen on colonoscopy at one year in 23 percent of the folate group and 38 percent of the placebo group. In the second year, recurrence was noted in 13 percent of the treatment group compared with 28 percent taking placebo. Neither finding was statistically significant. Summary of Adenoma: Trials These secondary prevention data are very inconsistent, with significant protection noted in some trials and no protection in others using similar protocols. Most of the data are, however, consistent with our hypothesis that there are several agents with significant or non-significant protective effects, [41, 43, 46-49] and that combinations of these agents with moderate effects would be the most effective preventive protocol. 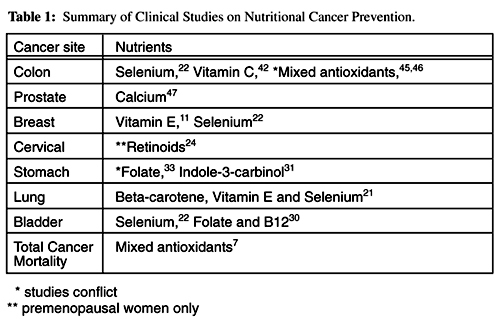 [46, 47] Table 1 summarizes cancer prevention trials.